This post is to show what we have done to incorporate care for oneself and others into our home. 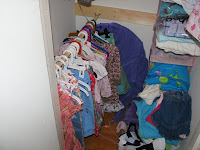 As you can expect - I still pick up coats, clothes and shoes from the floor on a daily basis, so don't be fooled into thinking this is how it normally is. I think that is hereditary!! 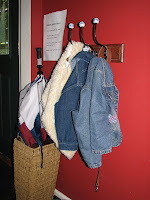 Coat pegs are kept low to the ground for the children to hang their own coats and outdoor wear. These cubbies from good ol' Ikea, were one of the best ideas I had!! 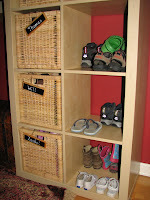 Each child has a cubby for shoes (the toddler at the bottom obviously and most of her shoes are velcro) and an adjoining box for hats, scarves, mittens and waterproofs. The top basket (it is a four shelf unit) contains sports kit and the bike helmets are on the top shelf. 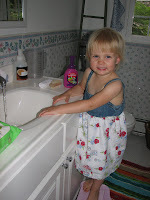 Again, I don't suppose many families have the luxury of pint sized sinks for washing, so I have a step stool again for the children to use. This is their own bathroom, the towels, wash cloths, soap, nailbrushes and toothbrushes are all within their reach. This is inside her wardrobe. She did originally only have one high rack so we had to choose and get her clothing. Using a broom handle we have put a low height one in. Now she has the "out of season" clothing on the top rack and on the accessible rack is the current season's clothing. She also can easily get at clean bed linen so she can at least assist me changing her sheets. 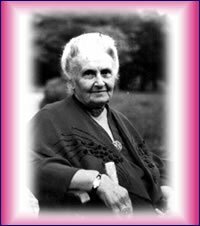 With regards to Montessori's thoughts to a bedroom environment, we haven't exactly followed her to plan. Our daughter doesn't sleep on a mattress on the floor as we had already started on the route of our bed, a crib, then her bed before we read this part! She also has more toys in her room than Montessori would have suggested. 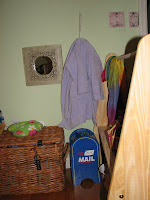 This is partly because we have so many of the darned things and partly because she needs her own space with her things which the boys like to hijack for their latest games! In our outdoor space we are caring for the native birds. We are soooo lucky here that we have a plethora of wildlife including red cardinals and hummingbirds for a couple. 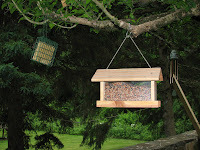 Unfortunately the squirrels rather like to pilfer the food before the birds get much of a look in, but the thought here is that the children can learn to take care of animals. 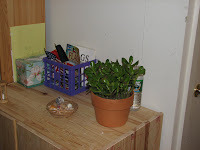 The boys both have a plant to take care of in their rooms. This is a succulent plant that only needs watering once a week and is easy care. We have a pet that our youngest has the responsibility to help feed and water and our middle child is responsible for sorting and taking out the recycling (which is hit and miss with him !!) We do compost (finally!) and we have an annual veggie patch and herb garden that the children help us with. Like I said, there are bound to be things to add to this over time!